Christmas Signs & Shelf sitters for all your holiday decorating needs - we also welcome hand painted custom requests for wooden signs! or use as an ornament. 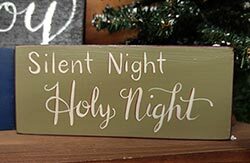 Add a pop of color and inspiring message to your mantel, wall, or desk with this hand painted shelf sitter sign, reading: "Silent night, holy night." 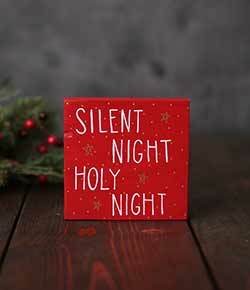 Silent Night Shelf Sitter / Sign Block, by Our Backyard Studio in Mill Creek, WA. Lettered completely free-hand in cream, wiht burgundy drop shadow and edges. Background is a muted green color. Galvanized tin sign painted red, featuring a hand-lettering-style font in cream, distressed for a rustic look, and lightly dusted with mica glitter. 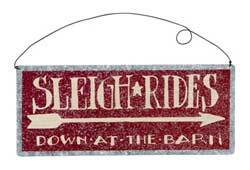 This one reads: Sleigh Rides, Down at the Barn. 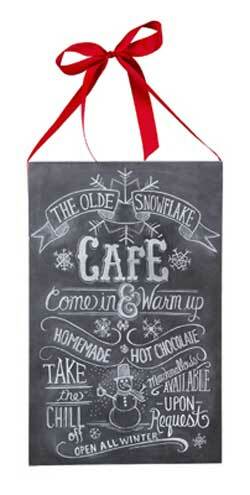 Snowflake Cafe Chalk Sign, by Primitives by Kathy. Deep wood box sign with decoupaged paper front printed with chalk-style lettering and a chalk-board look. Red ribbon attached all the way around, creating a bow on top for hanging. This one reads "snowflake cafe, come in & warm up, homemade hot chocolate, marshmallows available on request, take the chill off, open all winter." Measures 11.5 x 18 x 1.75 inches. Made of wood, intentionally distressed and aged for a rustic look. 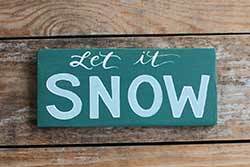 Snowflake Kisses Hand-Lettered Wooden Sign, by Our Backyard Studio in Mill Creek, WA. Painted on piece of quality wood molding reclaimed from a renovated house, this rustic wood sign features free-hand lettering in navy blue against an off-white background. Reads: "Snowflake Kisses." No computers/stencils/vinyl/transfers were used to create this sign - Painted the old-fashioned way, free-hand with professional sign painter's enamel and quill brush. 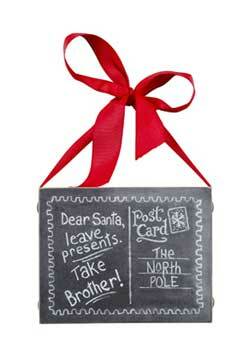 Take Brother Chalk Sign, by Primitives by Kathy. Deep wood box sign with decoupaged paper front printed with chalk-style lettering and a chalk-board look. Red ribbon attached all the way around, creating a bow on top for hanging. 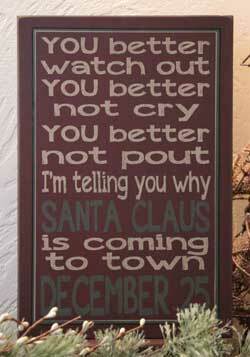 This one reads: "Dear Santa, Leave presents, take brother!" Measures 5.5 x 4.25 x 1.75 inches. Made of wood and paper, intentionally distressed and aged for a rustic look. 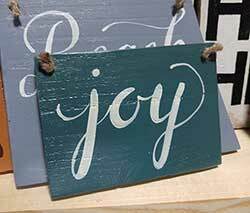 Unique with hand lettering and reclaimed wood, this small Joy sign will give a little dose of inspiration each day, and make an encouraging statement on your wall, shelf, or as a gift! 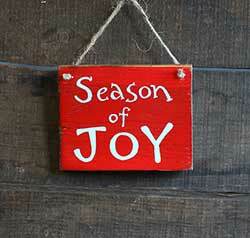 Decorate your home this winter with a unique, hand painted sign in winter blues. Tis the Season Chalk Sign, by Primitives by Kathy. Deep wood box sign with decoupaged paper front printed with chalk-style lettering and a chalk-board look. Red ribbon attached all the way around, creating a bow on top for hanging. This one features a deer head, and reads "Tis the season." Measures 8 x 6 x 1.75 inches. Made of wood, intentionally distressed and aged for a rustic look. Too Quick Box Sign, by Primitives by Kathy. 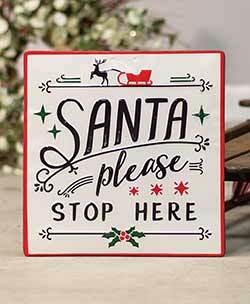 Painted and aged in white with red glitter lettering, these box signs hang on the wall or sit on a shelf. 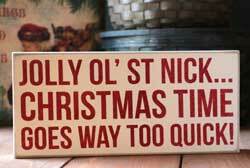 This one reads: Jolly ol' St. Nick...Christmas time goes way too quick! Measures approx 5 x 9 x 1.75 inches. Wood. Underwear Chalk Box Sign, by Primitives by Kathy. 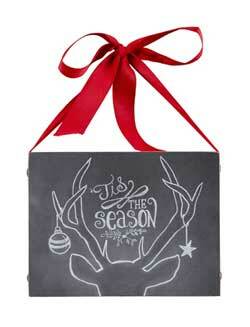 Features chalkboard artwork decoupaged to a deep wood box sign painted white, hanging from a red ribbon. 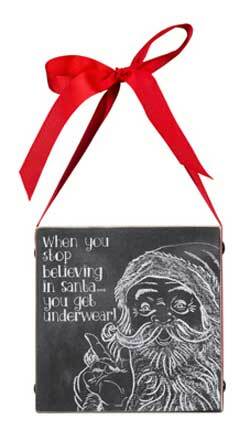 Reads: "When you stop believing in Santa you get underwear." Wood, paper, and ribbon, intentionally aged/distressed for a rustic look. 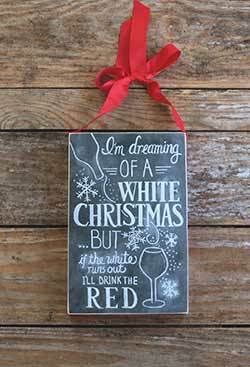 Reads "I'm dreaming of a white Christmas...but if the white is out, I'll drink the red!" Measures 6.5 x 10 x 1.75 inches. 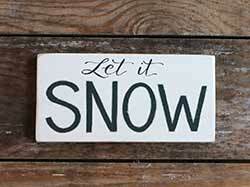 Spruce up your nest this winter with this hand lettered "let it snow" wood sign! Features modern hand lettered calligraphy and neutral winter color palette of grey, silver, and white.